This season so far has been a real struggle. We have had accidents, broken karts, blown motors and injuries holding the team back, but there has alway been a drive to keep going and work through the problems. Mid-Ohio was the start of getting things back on track. At Grattan Raceway over the July 14th weekend some of the struggles continued but they were bearable and It turned out to be some of the most fun we have had in awhile. Things got started on Friday this year with a full day of testing and practice, a new feature of this years race. Jason put in a lot of hard work despite being discouraged with a rocky start to the day. 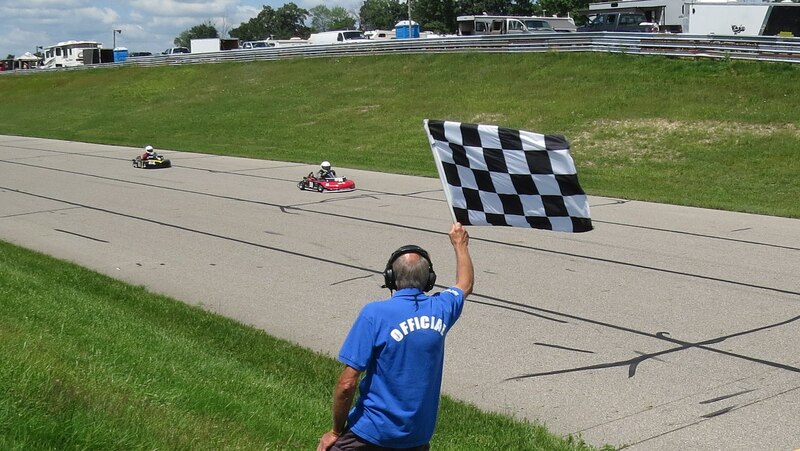 The last race for the road kart at Mid-Ohio left it hopping in the corners. This means that there was too much grip and the tires were sticking to the track and then suddenly breaking free and the sticking again, really fast. This slows the kart and makes driving nerve racking, “is the kart going to really break free and spin or stick again”. He reported the same issue at during the first practice session. First we changed the rear wheels to make the tires wider, this is supposed to make them loose. That did not help, finally near the end of the day we lowered the tire pressure by 4 pounds and it freed up nicely. Jason was able to driving it into the corners and his lap times dropped quickly. He is only a second or two off lap from the Animal 360 karts which is a great start to the weekend. The sprint kart was burping at the end of Mid-Ohio and it continued to do that here. Eventually, we found that the carburetor float no longer floating and causing fuel to flood the carburetor. Now that both karts are sorted out they just need a few gear changes to find the sweet spot for fast racing. It was a good day of work, but it was long and tiring. The sprint kart was great for Saturday’s practice and racing. The kart was fast and reliable. He was also running the 4 Cycle Central Animal Road Nationals in this kart, Unfortunately he is the only one in his class and he is the Animal Road Nationals Champion. The goal for the weekend is to keep trimming lap times and keep the kart in one piece. Jason started in 16th to 8th in race 1 and 10th in race 7 in Saturday’s races, a pretty good day. 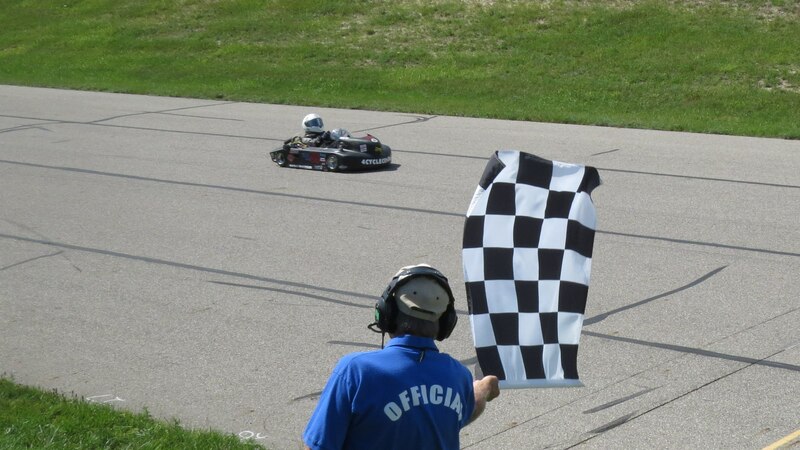 On Sunday practice was uneventful during the first race there was a clunk and “a part fell off and the kart got loose”. Jason pulled in but we could not find anything wrong so he went back out to finish the race. The kart was very loose and the back end kept wanting to step out but he held on till checkered flag. Post race we found that seat bolts had come loose on one of front struts. We fixed that, however, in the second race it was still not quite right. 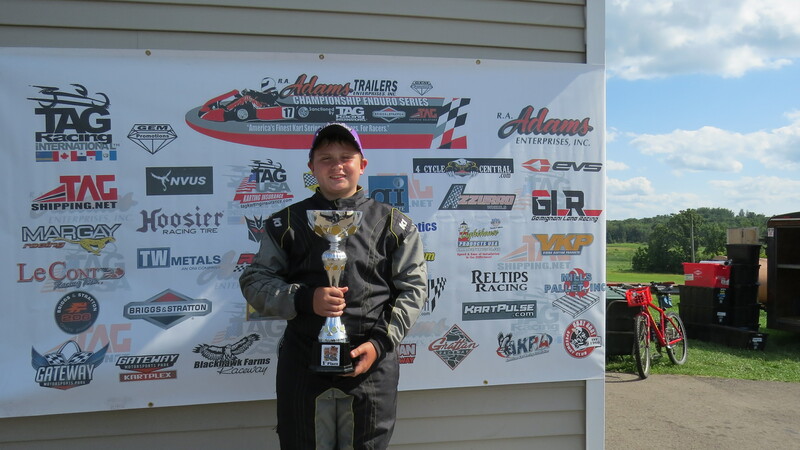 He stuck it out and battled the kart, all the while still driving some impressive lap times. During clean up we found the seat strut clamping bolt had fallen out and the seat was still loose and allowed the kart to flex and lose grip. We are still learning some of the racing fundamentals. In this case, be thorough and check every bolt. The road kart was pretty good all weekend long. He certainly has become much more comfortable driving it and keeps grinning when he pulls in. Probably the most difficult part of the both days was running 30 minutes in the road kart and then jumping out grabbing bottle of water while heading down to the grid for another 15 minutes in the sprint kart. He had to transition very quickly to a different style of driving and maintain the energy to keep going. Saturdays race was fun he pulled out to an early overall lead and looked to be walking away from everyone. As the race progressed he slowed as he tired and the kart tightened up. By the second to last lap another full bodied yamaha senior kart caught up to him and passed him in the heading into turn one. He gave chase but lapped traffic keep him from committing to a pass in the last lap. He finishing first in his class, of 5, and 2nd, of 13, over all. Sunday’s race 6 was a first as he lead the entire field start to finish for his 5th win of the day and first ever overall win. I have seen a change in Jason in the last few races, he is more focused and having more fun on the track. Oh, don’t worry, he still spent most of his non-track time catching a lot of fish. He is providing great feedback on handling and could tell me where and what the kart was doing. He is starting to look for a better kart instead of just the kart he is given. This is great, we know he can drive a less than ideal kart fast, but now he is starting to try to figure out what makes a really fast kart and driver. I have said he is fast but if I can get him a kart that was setup right he could be really fast, this is how we get him that kart. The Championship Enduro Series will be returning to Blackhawk Farms for their second race on August 12-13. We can be expected to attend a Monday Night Car Show between now and then as well. Thanks to the teams at Grattan Raceway, AKRA, Dart Kart Club, and Championship Enduro Series for putting on a great event. 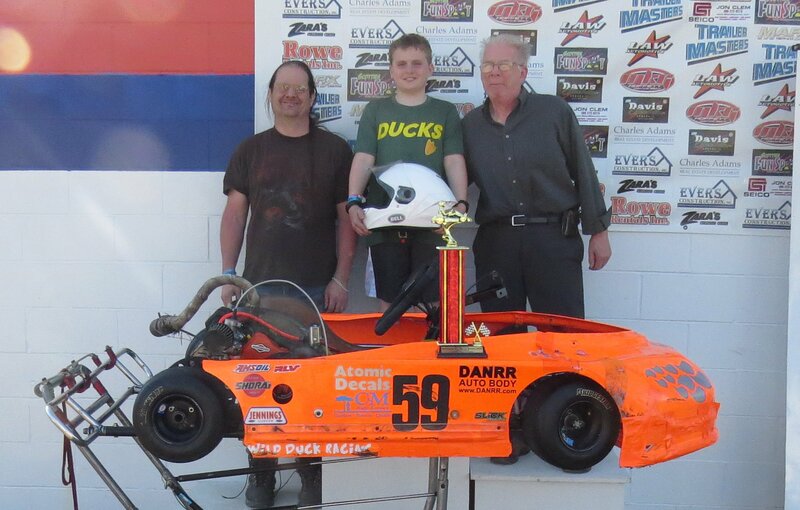 As per usual we owe gratitude to the Murray’s and Regan at 4 Cycle Central for keeping our karts fast and on the track.